Jan. 30, 1947: An ad in the Sentinel announces a preview of a model home in Carver Manor, a housing development designed by Paul R. Williams at 135th Street and Avalon Boulevard. Stanford Avenue in Carver Manor, via Google Street View. The Rev. J.L. Caston, a Baptist minister; attorney Lucius Lomax, publisher of the Los Angeles Tribune and the father of civil rights attorney Melanie Lomax; dental technician Albert Patrick; and attorney Vince M. Townsend Jr. announce that they are running in the City Council 7th District race against the incumbent, Rev. Carl C. Rasmussen, a Lutheran minister. 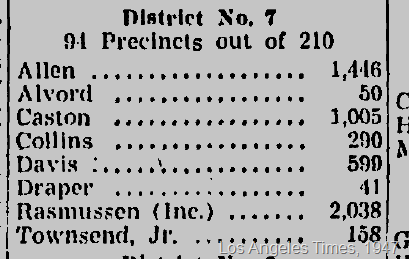 Rasmussen, who was white and endorsed by the Los Angeles Times, was reelected. Caston was endorsed by the Sentinel, which noted that he was an official of the NAACP, was active in the YMCA and was an honorary member of the Dining Car Workers Union. He placed third in the election after Rasmussen and Don A. Allen. Note: We’re rebooting the concept of the 1947project (founded by Kim Cooper and Nathan Marsak) by going day by day through 1947 – but using the Los Angeles Sentinel, an African American weekly, rather than the very white and very conservative Los Angeles Times. We promise you an extremely different view of Los Angeles. This entry was posted in 1947, African Americans, Architecture, City Hall, Politics and tagged #Paul Revere Williams, 1947, African Americans, architecture, City Council, Los Angeles Sentinel, politics. Bookmark the permalink.